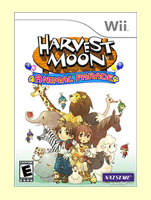 Harvest Moon: Animal Parade is the second Harvest Moon game for the Wii console system. Animal Parade is similar to the first Wii game, Tree of Tranquility, and has several upgrades from the previous version. 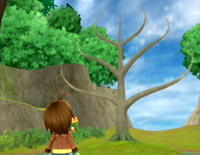 This version does not utilize the Wii-remote's functionality like in Tree of Tranquility, where players would have to swing the wii remote to perform tool actions, nor does it have the large amount of multi-player mini games. In Japan, the game is called Bokujou Monogatari: Wakuwaku Animal March (牧場物語わくわくアニマルマーチ) and was released on October 31, 2008. For Harvest Moon fans who live outside of North America (Europe and Australia) Rising Star Games has teamed up with Namco Bandi and will be releaseing Animal Parade in November 2010. Different languages have different release dates; English is November 26 and German is November 19. The game is also being released in Spanish, Italian, and French. The land of Castanet is split into various musical districts. The main hub of commerce is Harmonica Town, where you will find shops and residences. Your farm is located in the Clarinet District, which is connected to Flute Fields (which connects to the Fugue Forest) and the Garmon Mine District. In the Garmoni area you'll find the Goddess' Pond. There was once a divine tree in the middle of the Harvest Goddess' pond. One day the tree began to weaken, the air became stagnant, and the living creatures started to leave. The Goddess believes that the power from the Harvest King, who lives high in the heavens, can be used to help the wilted plant. If the 5 bells can be sounded by Harvest Sprites then the King should appear to help out the Goddess' divine tree. The Harvest Goddess uses the last of her power to create the little sprites, and instructs the orange sprite, Finn, to search for someone who can help. 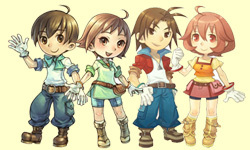 Animal Parade allows players to choose the gender and style of the protagonist. You can play as the original Tree of Tranquility characters, or select one of the new styles. The game plays exactly the same no matter what main character is chosen. Another change is the child system. In Harvest Moon Animal Parade, the spouse you choose will reflect on the looks of the children; if your spouse has blonde hair and green eyes, your children will also have the same traits. You can have two children instead of just one. Your spouse and children can help you with your farm work or other tasks that you assign. It is also easier to befriend the animals, whether they're the livestock you purchase for your farm or the wild animals you can convert into house pets. Besides just the Horse and Ostrich, you can now ride the Cow, Sheep, and Goat livestock animals. The Sheep can produce Milk as well as the standard Wool. Animal Parade also has a seasonal circus run by Theodore from Harvest Moon Magical Melody. The circus animals will help you navigate Castanet if you help Theodore with his problem. The passage of time has been slowed down. An hour in game takes about 3 minutes real time. Time also pauses when you go inside of buildings.